Hi everyone ! I finished a bunch of new things but in all the "cray-cray" of getting ready for back to school I haven't given you any details. 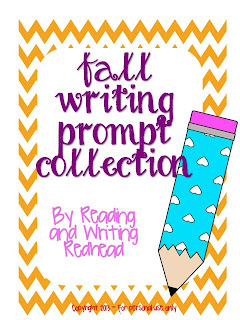 Finally, here's some info on the fall writing prompt collection. There are always fun things to write about that are seasonal so I decided to put this together. It includes 9 prompts and two kinds of writing paper - Handwriting without Tears paper, which is what my school uses - and standard lines paper. It is aligned to second grade Common Core Standards; however, you should be able to use it for grades, 1, 2, and 3. Here's a sneak peek atthe cover. If you click on the image you can see it at my TPT store. Here's a little example of one of the prompts. Usually my second graders do better when they have a checklist on their desk where they are writing so I like to include them right with the prompt. They fill out the checklist and then turn it in. Here's a little sample of the Handwriting without Tears paper. I also included a variety of black and white ink saving borders. Here's what the standard writing paper looks like with no border. But you'll have to look at it to see all the rest. Click on the image of the cover page to go to my TPT store to see more details, or if you prefer Teachers Notebook, click here.